The conference includes seminars, small-group workshops, and one-on-one sessions with some of the most accomplished and prominent authors, illustrators, editors, critics, and publishers in the world of children’s literature. Before attending Chautauqua, I was a relative "newbie" to writing for children. I'd freelanced for newspapers and magazines, but I hadn't published anything for children, or any fiction whatsoever. I had taken a class in writing for children and joined SCBWI. After hearing several fellow SCBWI members praise the Highlights conference, I looked into it. Initially, the cost was more than I was ready to invest in my fledgling career. Besides, how could I manage to get away for a whole week? Then, in 1996, I found out Sharon Creech was going to be on that year's faculty. 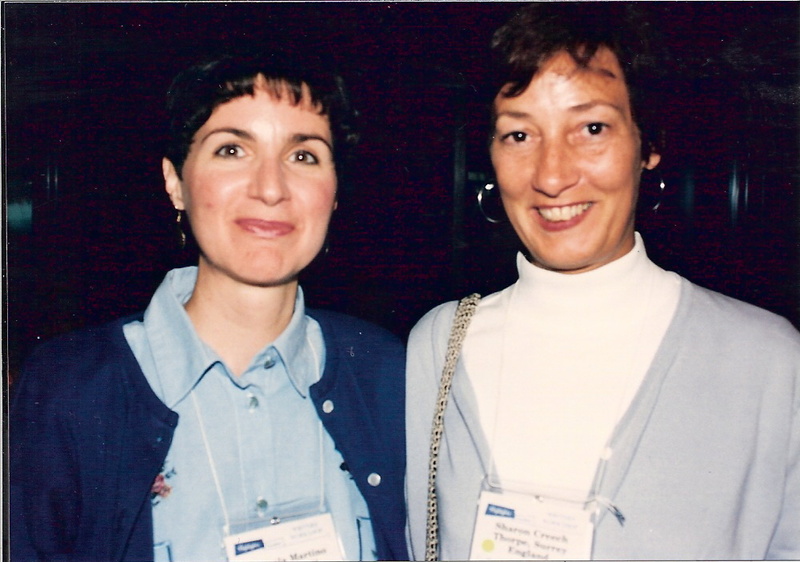 I was (and still am) a huge fan of her Newbery-winning novel, Walk Two Moons. As if that wasn't enough, Richard Peck was going to be there, too. Somehow, I found the money, made arrangements for my son to stay at my sister's, kissed my husband good-bye, and got on that plane. 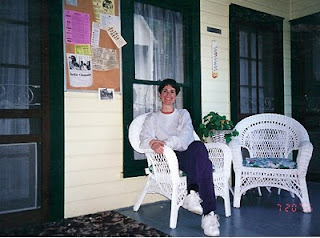 Here I am sitting on the front porch of the Spencer Hotel, where I stayed. Then I got my conference folder. I had submitted a manuscript for critique--the beginning of a young-adult novel I was working on. I did a double-take when I read the name of the faculty member who'd be critiquing my manuscript: Sharon Creech! Oh. My. Gosh. I was both thrilled and nervous. I mean, how do you talk to a Newbery-medalist? I was still trembling at my good fortune when I walked over to the opening banquet. One of the staff members at the door directed me to a table near the podium. As I sat down, the gentleman next to me introduced himself. Again I did a double-take. 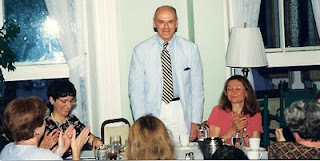 His name was Richard Peck. Oh. My. Gosh. Again. I was so nervous, I didn't know what to say. But he was so kind and friendly. He put me and all the other attendees at our table at ease right away. He spoke to us as peers, not only with small talk about where we were from, but also questions about what kind of writing we did. Then he got up and gave the most inspiring speech about writing for children that I had ever heard. 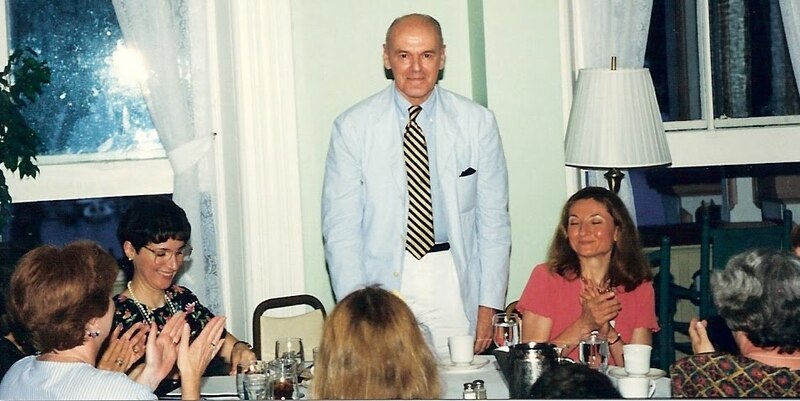 As everyone else applauded Richard Peck after his speech, I was still furiously taking notes (that's me on the left) so I wouldn't forget his words of wisdom. 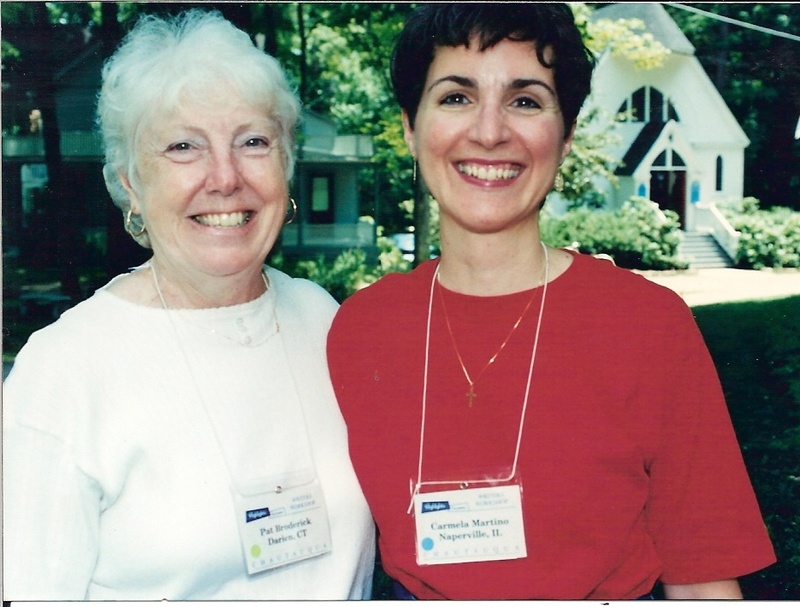 Later, when I had my one-on-one session with Sharon Creech, she put me at ease, too. She gave me specific advice on how I could improve my manuscript. And in our follow-up session, she even shared some marketing tips. "Writing can't be taught, but it can be learned." That quote helped me find the confidence to pursue my dream of writing fiction. I now share the quote with all my writing students. Here I am with Pat Broderick. Her advice really made me smile! As you spend your days and evenings with this group, you notice that no matter what stage of your writing career you are in, you feel respected. Your fellow attendees and the faculty care about you and your work. Everyone seems willing to help you achieve your goals as a writer. Even if you’ve never been published before, you feel like a writer. You are a writer. Attending the Highlights Writers Workshop at Chautauqua was an amazing experience for me. I left there feeling truly affirmed and renewed as a writer. I recommend the conference to everyone, but especially to beginning writers who really need that initial boost in confidence. Scholarships are available for those who can't afford it. And you can also read a host of writing tips from past conferences on their website. I'd love to know if any of you readers have also attended a Chautauqua conference. If you have, please post a comment about your experience. Over the next two weeks, my fellow TeachingAuthors will be sharing additional conference recommendations. I hope you'll share your recommendations, too. Carmela, I was there in '89 (I think -- could have been '88). 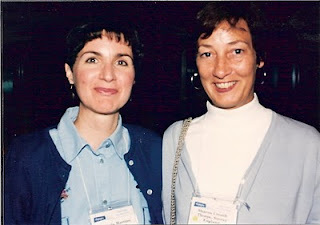 I still remember so many high points -- sharing meals and conversation with Eve Bunting and Patti Gauch, talking about children's books and writing all day long, the bats (!). I loved the enclosed, snug, old-fashioned feel to the village. I remember some of us went out to the little movie theatre one night and saw "The Unbearable Lightness of Being." That year I won the fiction contest, and I have a pic somewhere of Kent Brown handing me a trophy. I made friends at that conference who are still in my life. Highly recommended conference for newbies wanting to be nurtured! Very cool that you won their fiction contest, Toby. Thanks so much for sharing your experience! Carmela, I'm going to Chautauqua next month! How apt that you posted this today. My friend Sarah from my critique group, the Slushbusters, is going too. We've heard so many wonderful things about this conference. I envy you and Sarah, Michelle. I hope you both have a terrific experience! I was at Chautauqua in 2007. It was life changing for me as a writer. I can't say enough good things about it. I tell all my children's writer friends, you have to go to this conference. I'm belatedly commenting--sorry! So glad you enjoyed your time there, Carmela, and so glad to have met you! Thanks so much for taking time to comment, Sharon. No matter that it's belated!